Granuloma annulare (GA) is a benign inflammatory dermatosis. T. Colcott Fox first described granuloma annulare in 1895; however, not until 1902 did Radcliffe-Crocker label it as granuloma annulare. Granuloma annulare is relatively common disease that occurs in all age groups, but it is rare in infancy. [1, 2] Granuloma annulare is characterized clinically by dermal papules and annular plaques (see the image below). The precise cause is unknown. Histological examination reveals foci of degenerative collagen associated with palisaded granulomatous inflammation. Granuloma annulare. By Mierlo at English Wikipedia - Transferred from en.wikipedia to Commons by Stevenfruitsmaak using CommonsHelper., Public Domain, https://commons.wikimedia.org/w/index.php?curid=4560836. Localized granuloma annulare: This is the most common form. Localized granuloma annulare is characterized by skin-colored to violaceous lesions up to 5 cm in diameter. Usually, the epidermis has attenuated surface markings. Annular rings with solitary firm papules or nodules may be present. Localized granuloma annulare has a predilection for the feet, ankles, lower limbs, and wrists. Generalized granuloma annulare: This form occurs predominantly in adults. The trunk is usually involved, as well as the neck, extremities, face, scalp, palms, and soles. Lesions range from widespread papules to annular plaques to large, discolored patches with a variety of coloration from yellow to violaceous. Subcutaneous granuloma annulare  : This form occurs predominantly in children. Subcutaneous granuloma annulare is characterized by firm or hard asymptomatic nodules in the deep dermis or subcutaneous tissues, with individual lesions measuring from 5 mm to 4 cm in diameter. They are prevalent on the anterotibial plateau, ankles, dorsal feet, buttocks, hands, scalp, and eyelids. Perforating granuloma annulare  : This form is very rare. 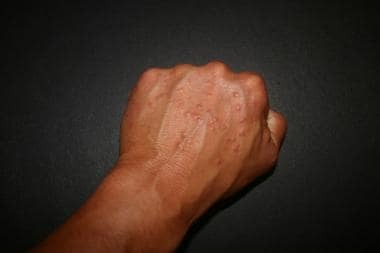 Perforating granuloma annulare is usually localized to the dorsal hands and fingers or may be generalized on the trunk and extremities. A variety of superficial umbilicated papules develop, with or without a discharge, that heal with scarring. Arcuate dermal erythema: This is an uncommon form of granuloma annulare that manifests as infiltrated erythematous patches that may form large, hyperpigmented rings with central clearing. Granuloma annulare has been hypothesized to be associated with tuberculosis, insect bites, trauma, sun exposure, thyroiditis, vaccinations, and viral infections, including HIV, Epstein-Barr virus, hepatitis B virus, hepatitis C virus, and herpes zoster virus. However, these suggested etiologic factors remain unproven. Familial cases of granuloma annulare observed in identical twins and siblings in several generations, along with an association of granuloma annulare with HLA phenotypes, suggest the possibility of a hereditary component in some cases. The HLA-B8 level has been reported to be increased in localized granuloma annulare; HLA-A29 and HLA-BW35 levels are reported to be increased in generalized granuloma annulare. Some reports associate chronic stress with granuloma annulare as a trigger of the disease. Granuloma annulare also has some predilection for the sun-exposed areas and photodamaged skin. Photosensitive granuloma annulare has been found in association with HIV infection. Finally, some cases of granuloma annulare or granuloma annulare–like reactions have been reported after gold therapy and treatment with allopurinol, diclofenac, quinidine, calcitonin, amlodipine, ACE inhibitors, daclizumab,  and calcium channel blockers. The frequency of granuloma annulare is in the general population is unknown. Granuloma annulare does not favor a particular race, ethnic group, or geographical area. Localized granuloma annulare is the most common among the various subtypes. Of all patients with granuloma annulare, 9-15% have the generalized variant. Perforating granuloma annulare has been reported to have a prevalence of 5% among granuloma annulare subtypes; further, reports suggest that this variant may be more common in the Hawaiian Islands. Women are affected by granuloma annulare twice as often as men. Localized granuloma annulare is most commonly found in children and in adults younger than 30 years. Generalized granuloma annulare demonstrates a bimodal age distribution, occurring in patients younger than 10 years and in patients aged 30-60 years. Although subcutaneous granuloma annulare can occur in adults, it is predominantly a disease of otherwise healthy children, who are typically aged 2-10 years. Similarly, perforating granuloma annulare most often affects children. Spontaneous resolution of localized granuloma annulare has occurred within 2 years in 50% of cases, although lesions may last weeks to decades. Recurrence, often at the same site, is noted in 40% of cases. Generalized granuloma annulare has a more chronic course, with rare spontaneous resolution, poor response to treatment, and frequent relapses. Subcutaneous granuloma annulare lesions often spontaneously regress. Local or distant recurrences have been reported in 20-75% of cases in different studies. Patients and families should be reassured about the typically benign nature and course of granuloma annulare. Piette EW, Rosenbach M. Granuloma annulare: Pathogenesis, disease associations and triggers, and therapeutic options. J Am Acad Dermatol. 2016 Sep. 75 (3):467-479. [Medline]. Piette EW, Rosenbach M. Granuloma annulare: Clinical and histologic variants, epidemiology, and genetics. J Am Acad Dermatol. 2016 Sep. 75 (3):457-465. [Medline]. Felner EI, Steinberg JB, Weinberg AG. Subcutaneous granuloma annulare: a review of 47 cases. Pediatrics. 1997 Dec. 100(6):965-7. [Medline]. Penas PF, Jones-Caballero M, Fraga J, Sanchez-Perez J, Garcia-Diez A. Perforating granuloma annulare. Int J Dermatol. 1997 May. 36(5):340-8. [Medline]. Ghadially R. Granuloma annulare, actinic granuloma. Arndt K, et al, eds. Cutaneous Medicine and Surgery. WB Saunders Co; 1996. 438-443. Mehta LR, Rose JW. Recurrent granuloma annulare during treatment with daclizumab. Mult Scler. 2009 Apr. 15(4):527-8. [Medline]. Kakourou T, Psychou F, Voutetakis A, Xaidara A, Stefanaki K, Dacou-Voutetakis C. Low serum insulin values in children with multiple lesions of granuloma annulare: a prospective study. J Eur Acad Dermatol Venereol. 2005 Jan. 19(1):30-4. [Medline]. Li A, Hogan DJ, Sanusi ID, Smoller BR. Granuloma annulare and malignant neoplasms. Am J Dermatopathol. 2003 Apr. 25(2):113-6. [Medline]. O'Brien JP, Regan W. Actinically degenerate elastic tissue is the likely antigenic basis of actinic granuloma of the skin and of temporal arteritis. J Am Acad Dermatol. 1999 Feb. 40(2 Pt 1):214-22. [Medline]. De Maeseneer M, Vande Walle H, Lenchik L, Machiels F, Desprechins B. Subcutaneous granuloma annulare: MR imaging findings. Skeletal Radiol. 1998 Apr. 27(4):215-7. [Medline]. Shehan JM, El-Azhary RA. Magnetic resonance imaging features of subcutaneous granuloma annulare. Pediatr Dermatol. 2005 Jul-Aug. 22(4):377-8. [Medline]. Blume-Peytavi U, Zouboulis CC, Jacobi H, Scholz A, Bisson S, Orfanos CE. Successful outcome of cryosurgery in patients with granuloma annulare. Br J Dermatol. 1994 Apr. 130(4):494-7. [Medline]. Sniezek PJ, DeBloom JR 2nd, Arpey CJ. Treatment of granuloma annulare with the 585 nm pulsed dye laser. Dermatol Surg. 2005 Oct. 31 (10):1370-3. [Medline]. Sliger BN, Burk CJ, Alvarez-Connelly E. Treatment of granuloma annulare with the 595 nm pulsed dye laser in a pediatric patient. Pediatr Dermatol. 2008 Mar-Apr. 25 (2):196-7. [Medline]. Liu A, Hexsel CL, Moy RL, Ozog DM. Granuloma annulare successfully treated using fractional photothermolysis with a 1,550-nm erbium-doped yttrium aluminum garnet fractionated laser. Dermatol Surg. 2011 May. 37 (5):712-5. [Medline]. Bronfenbrener R, Ragi J, Milgraum S. Granuloma annulare treated with excimer laser. J Clin Aesthet Dermatol. 2012 Nov. 5 (11):43-5. [Medline]. Passeron T, Fusade T, Vabres P, Bousquet-Rouaud R, Collet-Vilette AM, Dahan S, et al. Treatment of granuloma annulare with the 595-nm pulsed dye laser, a multicentre retrospective study with long-term follow-up. J Eur Acad Dermatol Venereol. 2011 Dec 21. [Medline]. Harth W, Linse R. Topical tacrolimus in granuloma annulare and necrobiosis lipoidica. Br J Dermatol. 2004 Apr. 150(4):792-4. [Medline]. Jain S, Stephens CJ. Successful treatment of disseminated granuloma annulare with topical tacrolimus. Br J Dermatol. 2004 May. 150(5):1042-3. [Medline]. Rigopoulos D, Prantsidis A, Christofidou E, Ioannides D, Gregoriou S, Katsambas A. Pimecrolimus 1% cream in the treatment of disseminated granuloma annulare. Br J Dermatol. 2005 Jun. 152(6):1364-5. [Medline]. Lopez-Navarro N, Castillo R, Gallardo MA, Alcaide A, Matilla A, Herrera E. Successful treatment of perforating granuloma annulare with 0.1% tacrolimus ointment. J Dermatolog Treat. 2008. 19 (6):376-7. [Medline]. Grieco T, Cantisani C, Faina P, Cantoresi F, Lacobellis F, Silvestri E, et al. Tacrolimus 0.1% and granuloma annulare: description of three cases. J Eur Acad Dermatol Venereol. 2009 Dec. 23 (12):1445-6. [Medline]. Gomez-Moyano E, Vera-Casaño A, Martinez S, Sanz A. Periorbital granuloma annulare successfully treated with tacrolimus 0.1% ointment. Int J Dermatol. 2014 Feb. 53 (2):e156-7. [Medline]. Kuwahara RT, Naylor MF, Skinner RB. Treatment of granuloma annulare with topical 5% imiquimod cream. Pediatr Dermatol. 2003 Jan-Feb. 20(1):90. [Medline]. Badavanis G, Monastirli A, Pasmatzi E, Tsambaos D. Successful treatment of granuloma annulare with imiquimod cream 5%: a report of four cases. Acta Derm Venereol. 2005. 85(6):547-8. [Medline]. Errichetti E, Stinco G, Pegolo E, Patrone P. Generalized Granuloma Annulare in a Cirrhotic Patient Treated with Narrowband Ultraviolet B Therapy. Indian J Dermatol. 2016 Jan-Feb. 61 (1):127. [Medline]. Ine K, Kabashima K, Koga C, Kobayashi M, Tokura Y, Kabashima K. Eruptive generalized granuloma annulare presenting with numerous micropapules. Int J Dermatol. 2010 Jan. 49 (1):104-5. [Medline]. Inui S, Nishida Y, Itami S, Katayama I. Disseminated granuloma annulare responsive to narrowband ultraviolet B therapy. J Am Acad Dermatol. 2005 Sep. 53 (3):533-4. [Medline]. Samson Yashar S, Gielczyk R, Scherschun L, Lim HW. Narrow-band ultraviolet B treatment for vitiligo, pruritus, and inflammatory dermatoses. Photodermatol Photoimmunol Photomed. 2003 Aug. 19 (4):164-8. [Medline]. Yong A, Chong WS, Pan JY. Disseminated granuloma annulare responding to narrowband UVB phototherapy. Photodermatol Photoimmunol Photomed. 2016 Mar. 32 (2):107-9. [Medline]. Mikami E, Yanase M, Ito M, Kanzaki A, Saeki H. Generalized granuloma annulare successfully treated with narrowband ultraviolet B and anti-hepatitis C virus therapy. J Dermatol. 2016 Feb 19. [Medline]. Pavlovsky M, Samuelov L, Sprecher E, Matz H. NB-UVB phototherapy for generalized granuloma annulare. Dermatol Ther. 2015 Dec 2. [Medline]. Kerker BJ, Huang CP, Morison WL. Photochemotherapy of generalized granuloma annulare. Arch Dermatol. 1990 Mar. 126(3):359-61. [Medline]. Batchelor R, Clark S. Clearance of generalized papular umbilicated granuloma annulare in a child with bath PUVA therapy. Pediatr Dermatol. 2006 Jan-Feb. 23 (1):72-4. [Medline]. Grundmann-Kollmann M, Ochsendorf FR, Zollner TM, Tegeder I, Kaufmann R, Podda M. Cream psoralen plus ultraviolet A therapy for granuloma annulare. Br J Dermatol. 2001 May. 144 (5):996-9. [Medline]. Browne F, Turner D, Goulden V. Psoralen and ultraviolet A in the treatment of granuloma annulare. Photodermatol Photoimmunol Photomed. 2011 Apr. 27 (2):81-4. [Medline]. Looney M, Smith KM. Isotretinoin in the treatment of granuloma annulare. Ann Pharmacother. 2004 Mar. 38(3):494-7. [Medline]. Schleicher SM, Milstein HJ. Resolution of disseminated granuloma annulare following isotretinoin therapy. Cutis. 1985 Aug. 36 (2):147-8. [Medline]. Schleicher SM, Milstein HJ, Lim SJ, Stanton CD. Resolution of disseminated granuloma annulare with isotretinoin. Int J Dermatol. 1992 May. 31 (5):371-2. [Medline]. Tang WY, Chong LY, Lo KK. Resolution of generalized granuloma annulare with isotretinoin therapy. Int J Dermatol. 1996 Jun. 35 (6):455-6. [Medline]. Sahin MT, Türel-Ermertcan A, Oztürkcan S, Türkdogan P. Generalized granuloma annulare in a patient with type II diabetes mellitus: successful treatment with isotretinoin. J Eur Acad Dermatol Venereol. 2006 Jan. 20 (1):111-4. [Medline]. Pasmatzi E, Georgiou S, Monastirli A, Tsambaos D. Temporary remission of disseminated granuloma annulare under oral isotretinoin therapy. Int J Dermatol. 2005 Feb. 44 (2):169-71. [Medline]. Adams DC, Hogan DJ. Improvement of chronic generalized granuloma annulare with isotretinoin. Arch Dermatol. 2002 Nov. 138 (11):1518-9. [Medline]. Grewal SK, Rubin C, Rosenbach M. Antimalarial therapy for granuloma annulare: Results of a retrospective analysis. J Am Acad Dermatol. 2017 Apr. 76 (4):765-767. [Medline]. Cannistraci C, Lesnoni La Parola I, Falchi M, Picardo M. Treatment of generalized granuloma annulare with hydroxychloroquine. Dermatology. 2005. 211 (2):167-8. [Medline]. Simon M Jr, von den Driesch P. Antimalarials for control of disseminated granuloma annulare in children. J Am Acad Dermatol. 1994 Dec. 31 (6):1064-5. [Medline]. Piaserico S, Zattra E, Linder D, Peserico A. Generalized granuloma annulare treated with methylaminolevulinate photodynamic therapy. Dermatology. 2009. 218(3):282-4. [Medline]. Weisenseel P, Kuznetsov AV, Molin S, Ruzicka T, Berking C, Prinz JC. Photodynamic therapy for granuloma annulare: more than a shot in the dark. Dermatology. 2008. 217(4):329-32. [Medline]. Calzavara-Pinton PG, Rossi MT, Sala R, Italian Group For Photodynamic Therapy. A retrospective analysis of real-life practice of off-label photodynamic therapy using methyl aminolevulinate (MAL-PDT) in 20 Italian dermatology departments. Part 2: oncologic and infectious indications. Photochem Photobiol Sci. 2013 Jan. 12 (1):158-65. [Medline]. Marcus DV, Mahmoud BH, Hamzavi IH. Granuloma annulare treated with rifampin, ofloxacin, and minocycline combination therapy. Arch Dermatol. 2009 Jul. 145(7):787-9. [Medline]. Garg S, Baveja S. Monthly rifampicin, ofloxacin, and minocycline therapy for generalized and localized granuloma annulare. Indian J Dermatol Venereol Leprol. 2015 Jan-Feb. 81 (1):35-9. [Medline]. Steiner A, Pehamberger H, Wolff K. Sulfone treatment of granuloma annulare. J Am Acad Dermatol. 1985 Dec. 13 (6):1004-8. [Medline]. Czarnecki DB, Gin D. The response of generalized granuloma annulare to dapsone. Acta Derm Venereol. 1986. 66 (1):82-4. [Medline]. Wolf F, Grezard P, Berard F, Clavel G, Perrot H. Generalized granuloma annulare and hepatitis B vaccination. Eur J Dermatol. 1998 Sep. 8 (6):435-6. [Medline]. Saied N, Schwartz RA, Estes SA. Treatment of generalized granuloma annulare with dapsone. Arch Dermatol. 1980 Dec. 116 (12):1345-6. [Medline]. Weber HO, Borelli C, Rocken M, Schaller M. Treatment of disseminated granuloma annulare with low-dose fumaric acid. Acta Derm Venereol. 2009. 89(3):295-8. [Medline]. Shupack J, Siu K. Resolving granuloma annulare with etanercept. Arch Dermatol. 2006 Mar. 142 (3):394-5. [Medline]. Kreuter A, Altmeyer P, Gambichler T. Failure of etanercept therapy in disseminated granuloma annulare. Arch Dermatol. 2006 Sep. 142 (9):1236-7; author reply 1237. [Medline]. Hertl MS, Haendle I, Schuler G, Hertl M. Rapid improvement of recalcitrant disseminated granuloma annulare upon treatment with the tumour necrosis factor-alpha inhibitor, infliximab. Br J Dermatol. 2005 Mar. 152 (3):552-5. [Medline]. Murdaca G, Colombo BM, Barabino G, Caiti M, Cagnati P, Puppo F. Anti-tumor necrosis factor-α treatment with infliximab for disseminated granuloma annulare. Am J Clin Dermatol. 2010 Dec 1. 11 (6):437-9. [Medline]. Amy de la Breteque M, Saussine A, Rybojad M, Kramkimel N, Vignon Pennamen MD, Bagot M, et al. Infliximab in recalcitrant granuloma annulare. Int J Dermatol. 2016 Feb. 55 (2):220-2. [Medline]. Rosmarin D, LaRaia A, Schlauder S, Gottlieb AB. Successful treatment of disseminated granuloma annulare with adalimumab. J Drugs Dermatol. 2009 Feb. 8(2):169-71. [Medline]. Torres T, Pinto Almeida T, Alves R, Sanches M, Selores M. Treatment of recalcitrant generalized granuloma annulare with adalimumab. J Drugs Dermatol. 2011 Dec. 10(12):1466-8. [Medline]. Min MS, Lebwohl M. Treatment of recalcitrant granuloma annulare (GA) with adalimumab: A single-center, observational study. J Am Acad Dermatol. 2016 Jan. 74 (1):127-33. [Medline]. Mahmood T, Mansouri B, Menter A. Successful treatment of generalized granuloma annulare with adalimumab. Clin Exp Dermatol. 2015 Jul. 40 (5):537-9. [Medline]. Werchau S, Enk A, Hartmann M. Generalized interstitial granuloma annulare--response to adalimumab. Int J Dermatol. 2010 Apr. 49 (4):457-60. [Medline]. Gass JK, Todd PM, Rytina E. Generalized granuloma annulare in a photosensitive distribution resolving with scarring and milia formation. Clin Exp Dermatol. 2009 Jul. 34(5):e53-5. [Medline].